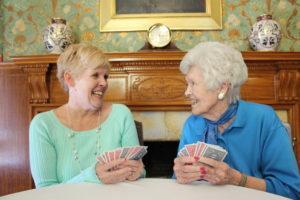 Our activity program features games, crafts, socials, entertainment and outings. Spacious common rooms, and a large television offer room for pleasant companionship and a warm welcome to visiting family and friends. The Board of Trustees and staff of the Home encourage all Guests to continue to pursue their usual activities, both within the Home and in the community. We try to accommodate resident interests and hobbies. We are pleased to offer meeting space for Guests’ clubs or groups. There are craft and sewing rooms on the third floor. For those who enjoy exercising, we have a safe ‘stepper’ exerciser. Mr. Davenport’s original pool and billiard table are still in use, as well as shuffleboard and darts. Gardening is available in the back yard.